Be the first to share your favorite memory, photo or story of Berthea. This memorial page is dedicated for family, friends and future generations to celebrate the life of their loved one. Berthea Lou Meyer nee Bye, of League City, Texas, was born on July 8, 1936 in Princeton, Indiana. She died Thursday, October 18, 2018 at her home in League City, Texas. Mrs. Meyer was a long-time resident of Melrose Park where she and Herbert raised their family before moving to Elgin in 1998. She has been residing in Texas for two years. Berthea was a proud mother and homemaker and worked for many years as an x-ray technician. She was an avid pianist, and a devout Christian. 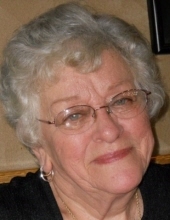 Berthea was a member Grace Lutheran Church in Streamwood for over 20 years. Her family includes, her daughters, Marianne (Caesar) Citraro, Debra Lynn (Paul) Taylor-Davis, and Patricia Deanne (Late Corey) Hindes; her grandchildren, Christopher Justin Taylor, Brad Lee (Lisa) Boyer, Jenessa M. (James) Donnellan, and, Connor M. Hindes; and her sisters, Patricia Robinson and Vicki Lewis. She was preceded in death by her husband of over 50 years, Herbert Edward Meyer, Jr.; and her father, Harold Bye. Visitation from 1:00 pm until time of Funeral Service at 4:00 pm, Sunday, October 28, 2018 at the Glueckert Funeral Home Ltd., 1520 North Arlington Heights Road, Arlington Heights, Illinois. Committal service 10:30 am, Monday, October 29, 2018 at Mount Emblem Cemetery interment chapel, Elmhurst, Illinois. "Email Address" would like to share the life celebration of Berthea Lou Meyer. Click on the "link" to go to share a favorite memory or leave a condolence message for the family.